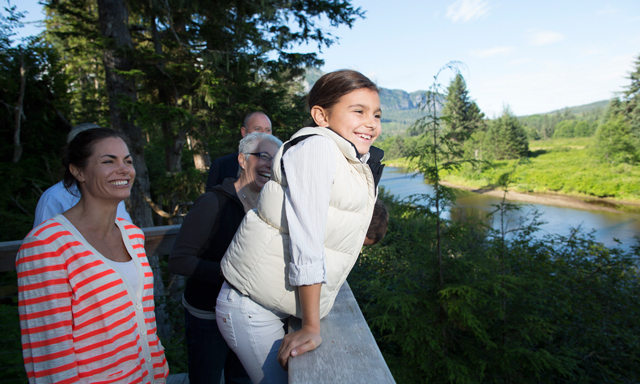 Delve into the fascinating history behind the indigenous Tlingit community as you explore Icy Strait Point’s nearby Hoonah village and watch a tribal dance performance. Travel through the small Chichagof Island fishing town, learning the rich oratory traditions and hunter-gatherer culture among the “people of the tides”, as your guide expounds on the group’s art, spiritualty, and cuisine. See live Huna Tlingit performers, donning traditional storytelling garb, singing and dancing in an interactive tribal celebration. • Hoonah: Visit the quaint fishing village, home to an indigenous Tlingit community, and explore its rich history on Chichagof Island. • Village Life: Discover the native group's oratory traditions, art history, culinary backgrounds, and religious beliefs as told by your guide. • Tribal Dance Show: Join along in a live singing, dancing, and storytelling celebration by Huna Tlinglit performers wearing traditional regalia. • No photography or videotaping during the tribal dance. • The performers will remain in their regalia for photos immediately afterwards.